You must ace an interview in order to get a job. While practice makes perfect, it is possible to ace interviews without ever having been interviewed once. The key is that you must prepare well, and prepare well in advance of the interview. This guide will show you how. Come up with as many tough and likely interview questions as you can, then plan & practice your answers to them. Do this in front of a mirror if you have to. 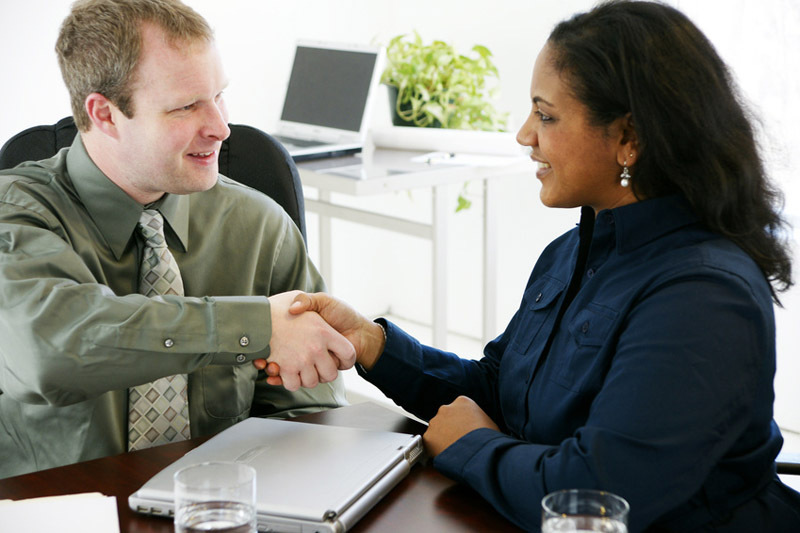 Most interviewers will try to evaluate your ability to do the job and the kind of employee that you will be. With careful preparation, you can convey to the interviewer that you are the perfect candidate for the job. These questions invite general answers. Remember the perfect candidate criteria: research the company and assess your resume. Present strengths and qualities that appeal to the company. The interviewer wants to see if you can think on your feet as well as gauge your field experience. Try to ask follow up questions before answering to avoid bland answers. Gather as much information as you can. These questions commonly catch people off guard because of their presumptuous nature. Take a moment to process the question before answering. For instance, you could be thrown with negative emphasis: “It must have been difficult to work with your boss,” or “What irritates you about coworkers?” Be careful to not take the bait, answer with positive emphasis. Never ever speak negatively of other people you worked with in the past; this could show that the problem is you, not others. Talk about how you worked together with the other people to resolve an issue. You can talk about how your personality did not fit the environment, but do not place blame on others. When a question is asked and chained immediately by additional questions, you have a multi-barreled question. “What do you think about our new product? Do you think the customer interface can be improved and if so, how?��� Your reasoning skills are being assessed—answer each part, ensure that the answers are well-structured and flow smoothly. When answering, do not be afraid to ask the interviewer to repeat or rephrase the question. S – Situation: describe the situation. T – Task: what was the problem? A – Action: what did you do to solve the problem? R ��� Result: what was the outcome of your actions? This part is very important. Refer back here when writing practice responses to interview questions. Remain positive with a respectable outlook. Do not speak negatively of others, and do not speak of problems you had with others with no attempt at conflict resolution. Relate your answers to convey that you are very qualified for the position. The idea is to prove that you are the perfect candidate without actually saying that you are. Show that you can are a team player as well as self-motivated. Research the company and target your responses to what you find. This question is not as open-ended as it appears at first. Don’t talk about your life history from birth. What the interviewer wants is a brief, couple-minute description of why you are the best candidate for the job. You can tell your interviewer about where you went to college, what you studied, your professional capabilities, your career, etc. Don’t sound rehearsed, though. Find out what characteristics might be ideal for the job and present yourself as such. Do not use: “I’m a perfectionist” or “I work too much.” Not only is no one perfect, but this answer is 99% canned. What the hiring manager wants to know is what difficulties you had in the past and how you managed them. For example, you might mention how you were hesitant to delegate tasks to other people because you thought you could handle everything yourself. You took on more than you were able to handle. You realized your mistake and took courses on time management and effective delegation techniques. They want to see growth and maturity. Be sure that the weakness is not a key factor of the position you are contending for. Do you work better independently or on a team? “I do well working both on a team as well as independently.��� It is better to show that you are balanced. Also elaborate on details. Relate your previous position or your career goals to the position you are contending for. Give examples of how you have done well in balancing independent work as well as team work. Use STAR. Tell what stress-management and problem-solving skills you may have used or describe the decision-making process you went through. Do not be afraid to admit that you might ask for help from others if overwhelmed; it’s completely normal. A senior comes to work with a bad attitude that might be affecting company productiveness. What do you do? Be forward-looking. Do not speak ill of the people you worked with. Do not talk about major problems with management or coworkers. Be positive, talk about finding a better environment that provides opportunities for growth. You should be open and honest, but don’t dwell on this question. Don���t be distracted by it. Concentrate on what you can offer the company. What is more important, money or work? ���I’ve always wanted to work at a company that…” Now this is where you do some research about the company. Find specific qualities about the company and tie those in with your response. Use examples to explain how your qualifications match the company vision and goals. Don’t actually say that you are the best person. Be confident and enthusiastic as you emphasize qualities in you that the company values. If you are stuck formulating a response, try developing these phrases into complete sentences: fast learner, extensive experience, dedication to helping company meet goals, self-starter, self-motivated, etc. Focus on realistic objectives and describe what you are doing to achieve them. Not every interview will unfold the same way. Expect to be thrown off balance. It is possible that you might only get questions about the company. Or you might only questions about your last project. These examples are far-fetched but expect the unexpected. Prepare to turn profit out of unfavorable opportunities. Spend some time reviewing your resume and your personal qualities. Be prepared to present your best selling points. Remember to be confident, make eye contact, and smile early and often. Know your employer. Research the organization or company that is interviewing you. Employers expect that you have knowledge of their organization. Read the company literature. More often than not these can be found on the internet. In many scenarios you will be asked questions about the company during interviews. Do not be caught off-guard. More often than not the last question of your interview is probably going to be ���do you have any questions?” To not have any questions is going to be your mistake. It shows that you lack interest in the company and the job. Always have questions ready for your interviewer. Stand out from the rest—prove that you are a self-starter. Prepare quality questions before you go to your interview. Ask questions that relate to the company. Show interest in the company by asking questions that show that you have done your research. Ask about its accomplishments, mission statements, projects, and challenges. Do not ask questions about your own gains. Do not ask about raises, benefits, or money. You can do that when you receive an offer by the company later. Ask, “Is there anything we’ve talked about so far that makes you think I am not the best candidate for the job?” If they mention something, this is your final chance to redeem their opinion of you. For example, you may have a lack of experience. You should think about possible weaknesses ahead of time and prepare an answer. For instance, “I know I lack experience, but for the experience I lack I make up for in strong enthusiasm to learn. I’m a fast learner and hard worker. I will give you my very best.” Or something to that effect. Give them reassurance that they will not waste their time on you. A question you will most likely want to finish the interview with is: “When will the final decision be made?” Asking this will not only show that you are interested, but will give you the peace of mind of not having to wait around and stress about if/when you will be notified. I tell you this from experience. This question is crucial, write it down. Dress appropriately. Keep to conservative colors, such as navy, black, or gray. Socks should match pants, and belt should match shoes. Wear a tie and dress shoes. Women should wear business suits or long dresses. For men business suits are appropriate, but it depends on the job and organization. If you are not sure, just ask. Be well-groomed and clean-shaven. Plan to arrive at least 10-15 minutes earlier than your appointment time. Come earlier if you need some time to relax and gather your thoughts. You do not want to show up late or right on time, it reflects very poorly on you. Leave a strong first impression. First impressions are hard to revert. When you meet the employer, smile, make eye contact, give a firm handshake (not too hard or too soft), and greet him or her by name. Follow the employer’s lead. Do not sit until he or she tells you where you may sit. Maintain eye contact. But there is no need to stare the entire time either. Stay calm. If you feel nervous, remember that nervousness is very normal. Just relax and breathe slowly and deeply. Be a good listener. Wait for the employer to finish speaking before you answer questions. Cutting people off can reflect poorly on you.